Francis Brockman, left, and Daniel Rottenborn. Government policy impacts human life. It’s a truth that is reinforced every day at the Annunciation House, a Catholic organization that gives shelter to refugees in El Paso. 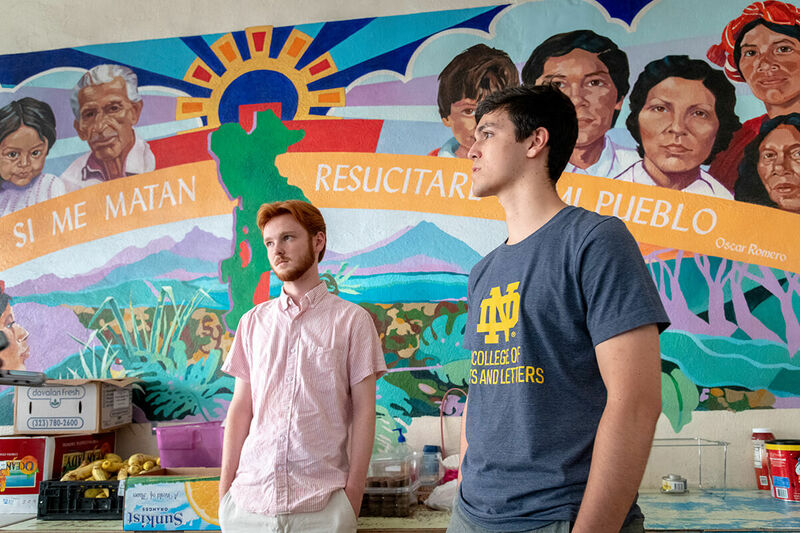 Two Arts and Letters students, junior Francis Brockman and sophomore Daniel Rottenborn, are working at one of the organization’s facilities, Casa Vides, a weathered two-story facility that has the look of a small apartment building just a few blocks from downtown. Inside, murals commemorate watershed moments and important figures in Central American conflicts, the bright colors painting a literal picture of the past that still impacts the people who come through the door today. It’s here that asylum-seeking migrants spend a few days in between their release from Immigration and Customs Enforcement detention and continuing their journey to a sponsor somewhere in the U.S.
Brockman and Rottenborn are working here as part of the Summer Service Learning Program through Notre Dame’s Center for Social Concerns. The program aims to address questions of social justice in light of Catholic social teaching. At Casa Vides, Rottenborn and Brockman are living among a population most only know through news reports, and gaining a perspective that only community can provide. To read more, click or tap here or the image above. Originally published by Andy Fuller at al.nd.edu on July 09, 2018.